Abstract - In this article, we focus on conflict management when learning traditional medicine. The traditional medicine is involved in almost all diseases that man can encounter using natural products from plant, mineral, animal. The aim is to lay a solid diagnosis in order to implement an effective treatment and minimize the risk of physical and social imbalance of patients. We particularly analyze the different techniques on the basis of visual semantic ontology in order to avoid similar indexing or conflict of a concept (dosages, therapeutic effects). We also analyze the influence of the consideration of the different parts of a query. Abstract - In modern age we cannot live without technology. Technology became a part of our life. In our daily life directly or indirectly we face latest technologies. Android users are increasing in world fatally due to with a reduction of cost. Especially in under developing countries android users are increasing. People of different ages use android phones like men women kids etc. When kids use android smart phone the question arise in the mind of their parents what they can do for children security. Is some guiding their kids on immoral manners? What the children do with their smart phone. We suggest a prototype of an application that will help parents to monitor their child activities on cell phone via GSM SMS based even if edge, or any other tools not available for online access. Abstract - In this paper, two bandpass SIW filter based on Complementary Split Ring Resonators (CSRRs) were presented for X-band applications. Which are designed by two methods, . The bandpass filter is treated by two softwares. 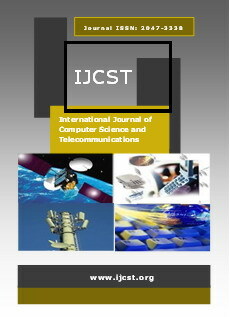 The first software concerns the use of CST Microwave Studio (Computer Simulation Technology) based by method of moment and three square double rings CSRRs cells are etched in the top plane of the SIW, the simulated results of this filter have shown that the passband is from 7.350 GHz to 8.850 GHz, while the insertion loss is -0.8350 dB within 18.59 % bandwidth around 8.450 GHz and input return loss in the passband is better than -14.92 dB. The second software concerns the finite element method (FEM) based on a commercial software package HFSS (High Frequency Structure Simulator) is used for simulations and three square double rings CSRRs cells are etched on the top plane of the SIW, the simulated results of this filter have shown that the passband is from 7.20 GHz to 8.750 GHz, while the insertion loss is -0.8141 dB within 19.27% bandwidth around 8.350 GHz and the return loss in the passband is better than -17.05 dB. All the structures are designed on a single substrate of RT / Duroid. Abstract - Functional cohesion is one of quality metrics in software engineering that take effect for increasing readability, reliability and make maintenance easier. In this paper, we measure functional cohesion on object-oriented systems. So we focus on object class and calculate functional cohesion of inside object class. First, Measuring functional cohesion of each method has be done then based on weight of each method in class, summarize functional cohesion of all methods and then would receive to functional cohesion on object class. Experiments have be done on many standard source codes of object oriented applications for extracting glue and super gules and use data dependency graph and SFC & WFC method formula, then compare them with each other's, some results presented with histograms at end of this research.